I’ve got a really unique opportunity just barely within my reach here, but I need some help to get there. I think if you’ve read anything on this blog at all, it’s pretty apparent that I am very passionate about trans history. It’s getting to the point now where I’m starting look, quite seriously, at how I could build my career as a historian around it. And…. well, that’s where you folks can come in. I’ve got a really unique opportunity here–as an academic, as a trans person, as a human being–and I want to share a little about it with you, because I can’t do it alone. 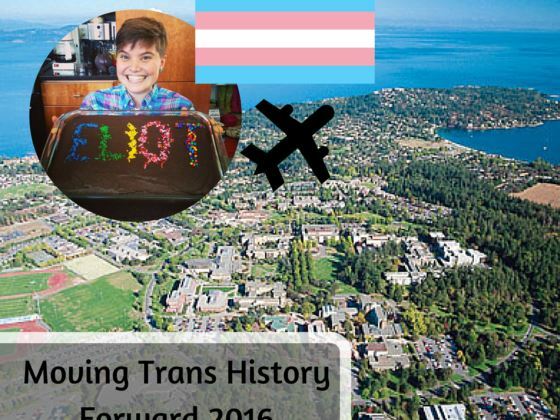 This month, the University of Victoria is holding a conference on transgender history called Moving Trans History Forward. It’s an opportunity for activists, academics, and just regular trans folks, to get together and talk about where we’ve been and where we’re going. As someone who writes about trans history even casually, this is a nerdgasm. But as someone who’s looking to apply for Master’s programs in the next year, this is like a launchpad to space. (Space is super gay, didn’t you know?) Going to this conference would allow me to visit theÂ onlyÂ transgender archives in North America (opened this year, at the University of Victoria!) and meet all kinds of people in the field–inÂ myÂ field–including people who could help me get launched on a real career in trans history and trans advocacy. I cannot even really put into words how much this would mean to me. I have been quite privileged to be accepted, on application, to attend the conference without having to pay the nearly $300 registration fee. And I am super, super grateful for that–but I live in Ontario, and Victoria is more than 4,000 km away. So I need help getting there. I’ve set up a crowdfunding pageÂ to try to cover the cost of my flight. I’m almost half-way to funding it, but the conference is just two weeks away. I’ve asked for help from my university (in three or four different ways) and all have come up empty. I’m currently unemployed. I do not have $900 or $1000 to spend, as much as I would, in a heartbeat, do so, because I believe this opportunity could really be the start of something important for me. So. If you’ve been following my blog, if you’ve learned something (and gosh, I hope you have, because these posts take HOURS of research and writing), now would be a great time to give a little back. You can click through to my crowdfunding page, or donate directly to me via that little envelope on the right there. Now would also be a great time to check out my knitting and accessories side-gig, where I can knit something fabulous for you, or make you custom-embroidered art that will last a hundred years. I’d really like to make an EXTRA big appeal to my non-Canadian followers–my dollar isÂ crapÂ right now, which is terrible for me, but great in terms of soliciting your help because your dollar will stretch much farther than mine! $20 Canadian is only $15US! It’s only Â£10! And every little bit gets me closer to living a very big dream of mine. If you’ve got crazy air miles or something you’d be willing to share, please shoot me an e-mail, I’m sure we can figure something out. So again, click here to please please please donate, Â or come see me about a commission! All my donors (who are comfy sharing their address or email) will be getting a thank-you note from me, and any donors over $25 CAD will get a postcard from me, live, from the conference. And all of you, of course, will benefit from So Much Blogging about my experience, things I learn there, and anything that sparks my interest enough to get a post out of it.